Inspired by Michael Sandler's post of his tour from a few years back, I visited the GO manufactory for my birthday last week. My wife and I were in Berlin for a holiday and we rented a car and took the 2 hour autobahn jaunt to Saxony. It was a tremendous experience and I recommend it for all GO enthusiasts and watch enthusiasts in general. I was very impressed by the openness, transparency, and access provided to tour guests. Our guide's name was Michael (I apologize but I forget his last name) and he was highly knowledgeable. 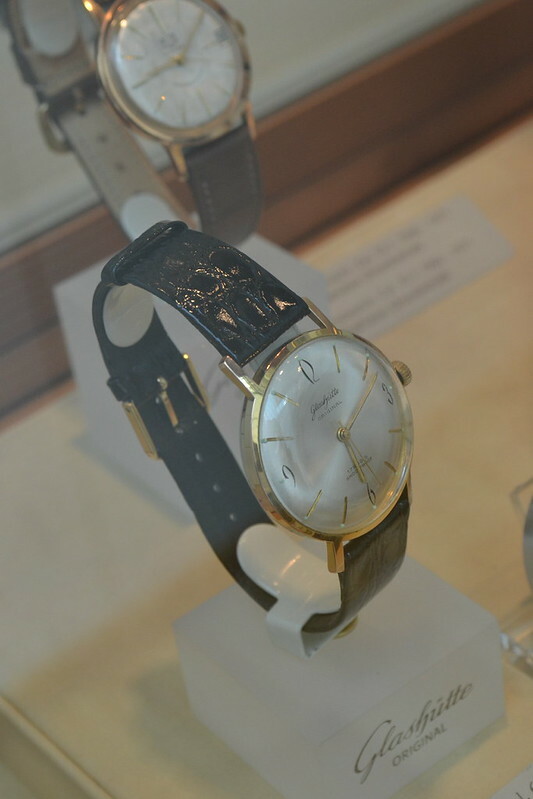 Frankly the tour left me with the desire to get another Glashutte Original watch! No surprise there. The manufactory building on a cloudy-but-nice May afternoon. We had just wolfed down some doner kebabs from the cafe around the corner and then sprinted over to the building to make it to our tour on time. There were two other people in the cafe - one wearing a Lange work outfit, and a nicely dressed woman who turned out to be the GO receptionist. 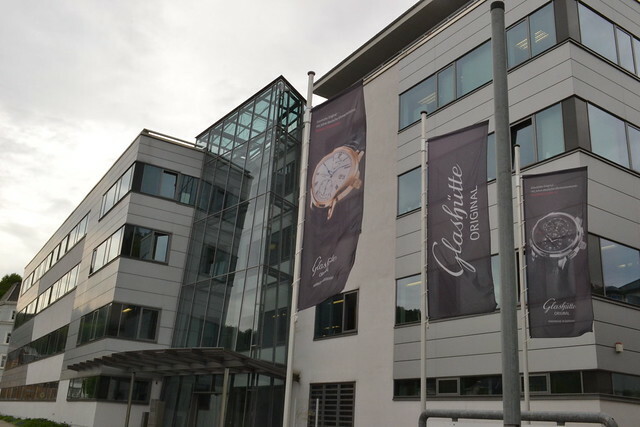 We started the tour with a discussion of the history of Glashutte, watchmaking in the region, and how GO came to be. 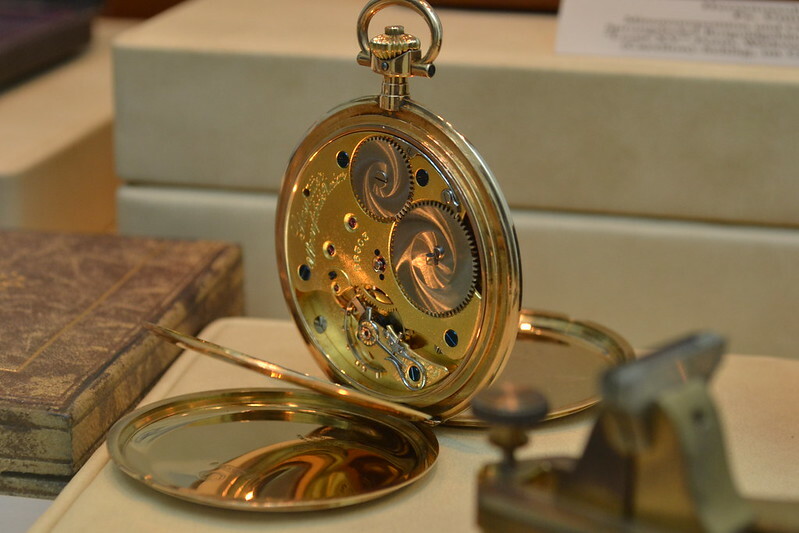 There were some remarkable watches in the display cases including this pocket watch which shows how the phrase "Original" was used to demonstrate authenticity in the prewar era. 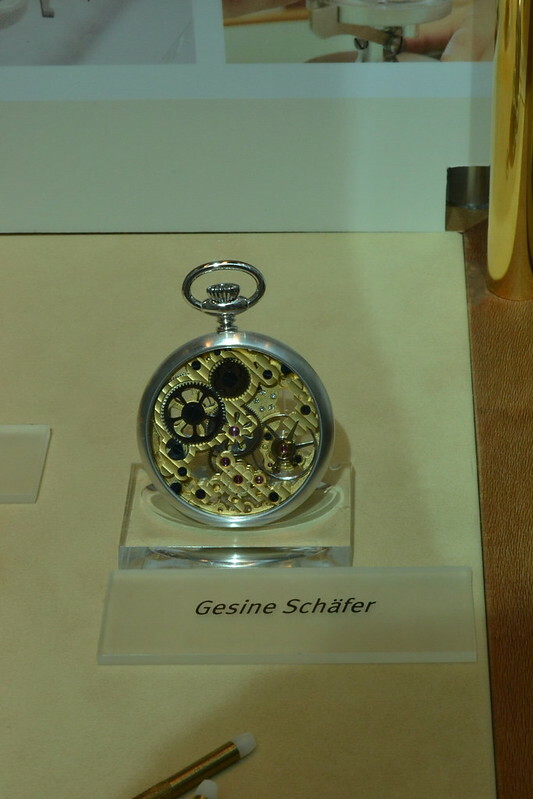 This pocketwatch demonstrates some of the construction and decoration elements that have been maintained in Glashutte Original watches today - note the three-quarter plate, the sunburst decoration on the gears, and the swan-neck spring. 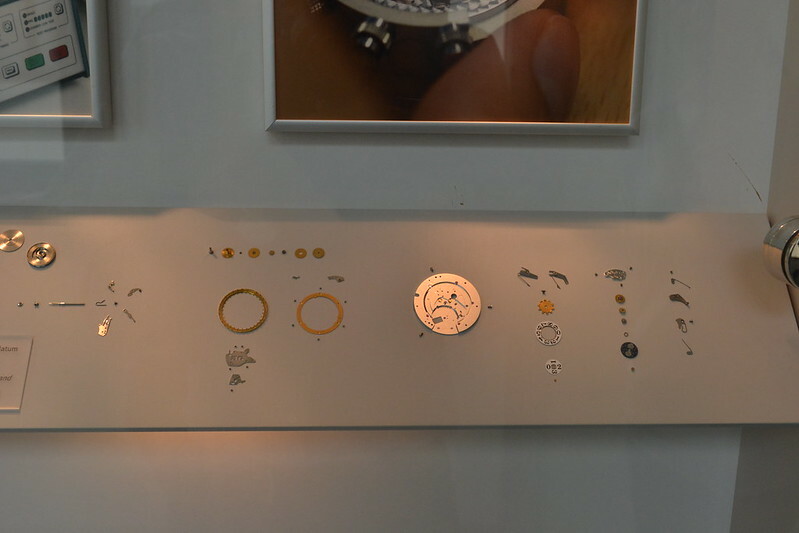 The display also contained some of the best works from the Glashutte Original watchmaking school. 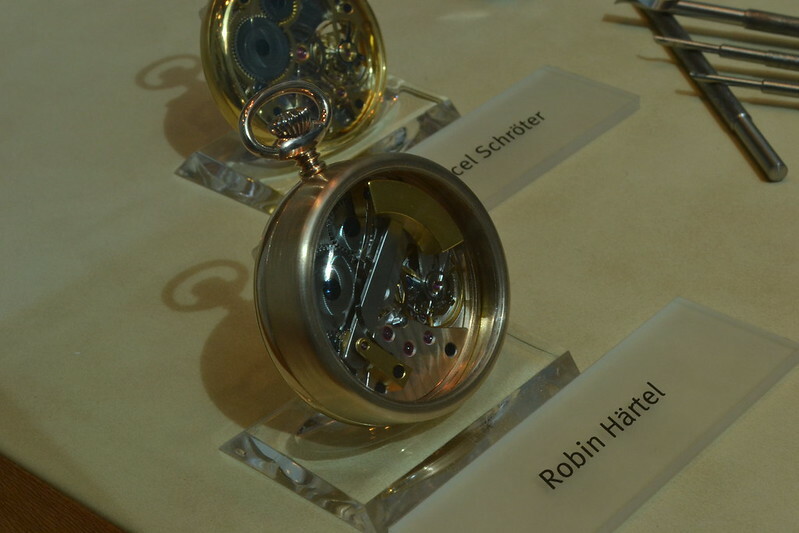 Student watchmakers are given a pocket watch movement and encouraged to create, tinker, and decorate as an independent project. The remaining photos mostly recapitulate Michael's earlier tour pics, but I'll highlight a few things. Note that GO appears to be in expansion mode right now. When Michael and the TZ group toured in 2006 there were just under 300 employees. Now there are 350 and they plan to expand to 400 soon. The group will spill over to a building down the road as they are running out of space. I was impressed with the amount of checking and measuring that is done at each step. 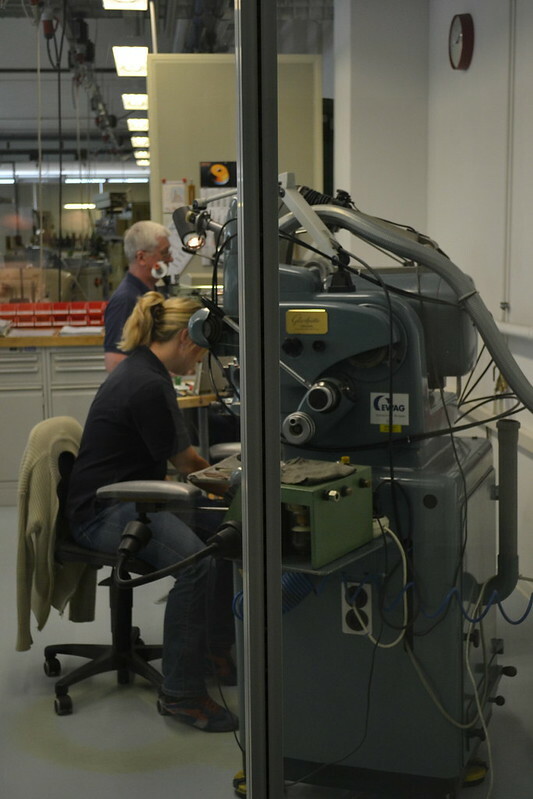 While a lot of fabrication is understandably mechanized, everything is measured by hand at multiple steps. This plate is apparently measured in 45 points. Decoration is also done mostly by hand. 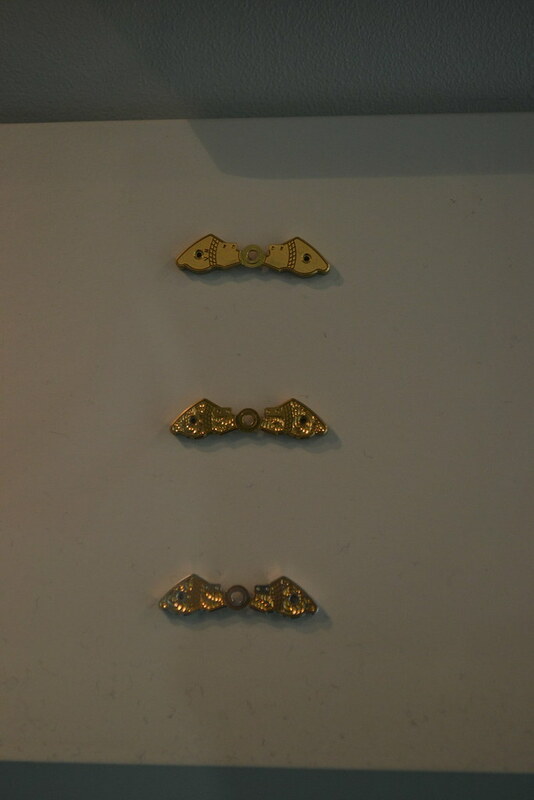 Here's a tray of movement parts with a variety of hand decorations. It's pretty amazing how steady a hand these folks have. 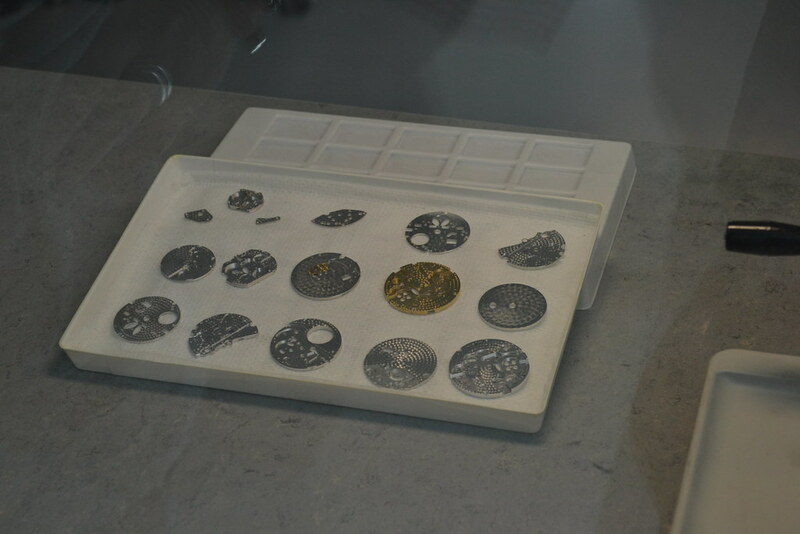 A rhodium-finished plate ready for peg pressing. 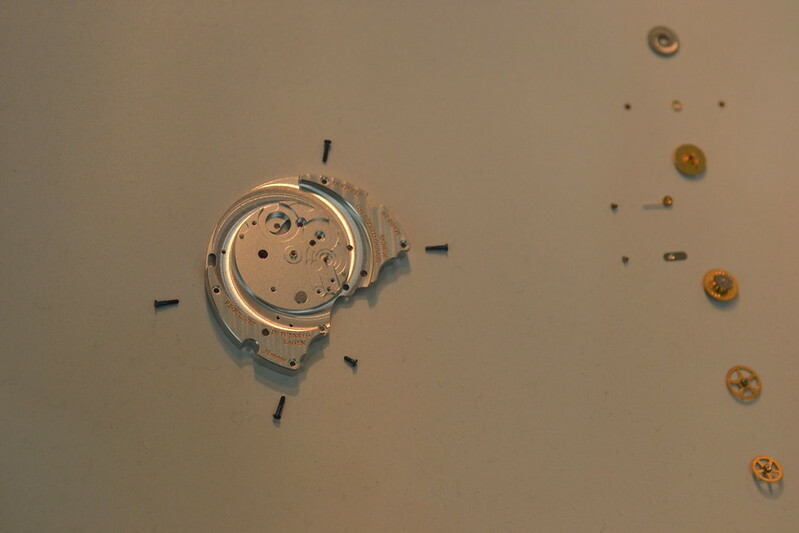 Note that GO makes all its own screws and pegs. Before the tour I had read, but I didn't believe, that the decoration on the balance bridge was done by hand. Well it appears to be true. 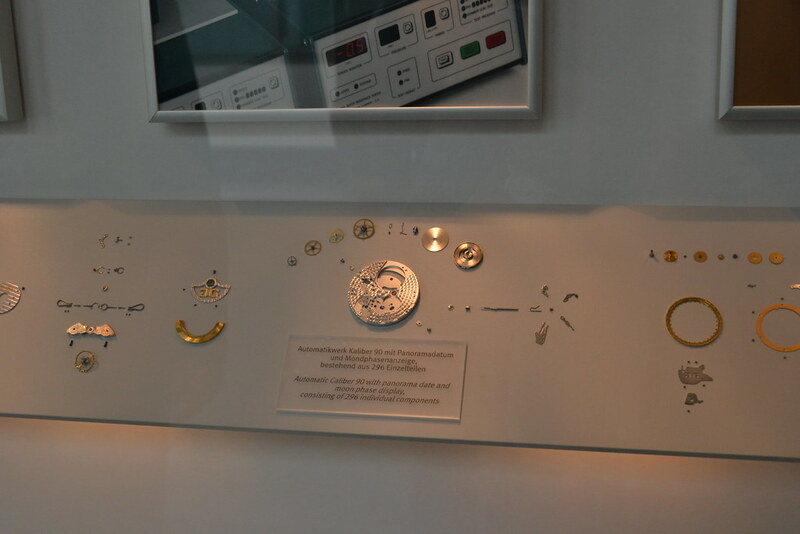 Unfortunately the engraver was not there when I toured but we saw a video of the process. I have more respect now for my PML. 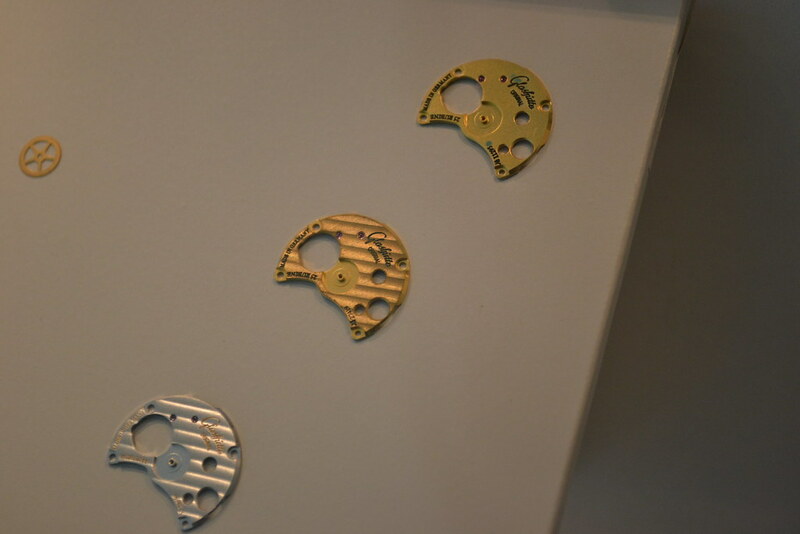 You can see here how a plate evolves from a brass cutout, to decorated brass, to rhodium-plated. 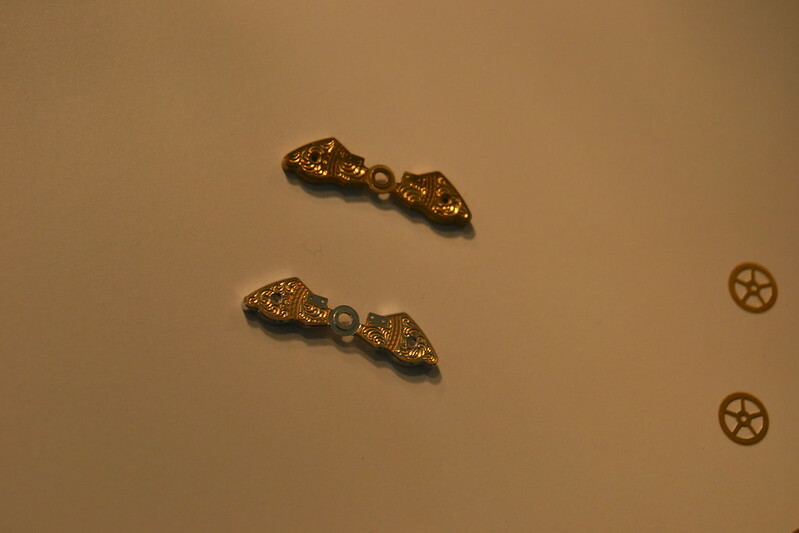 Brass is used for its durability and predictable physical characteristics. The assembly room. 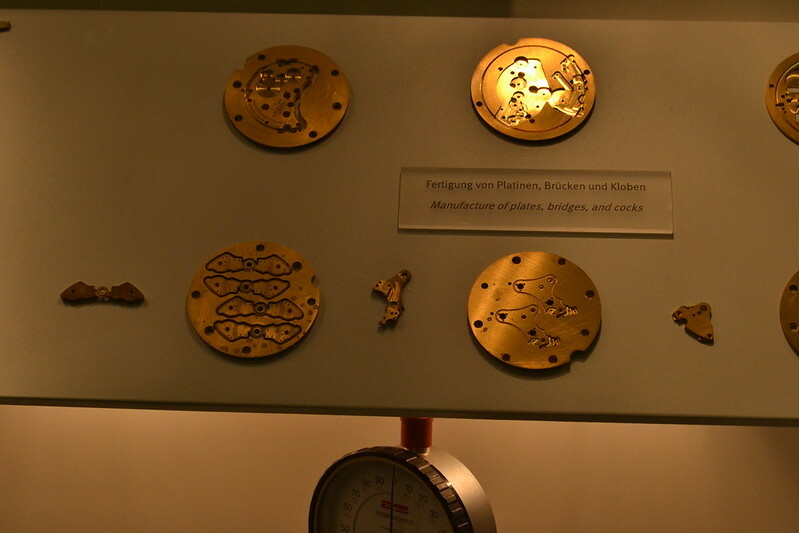 Watchmakers tend to work in small teams of 4-6 people on a given model. 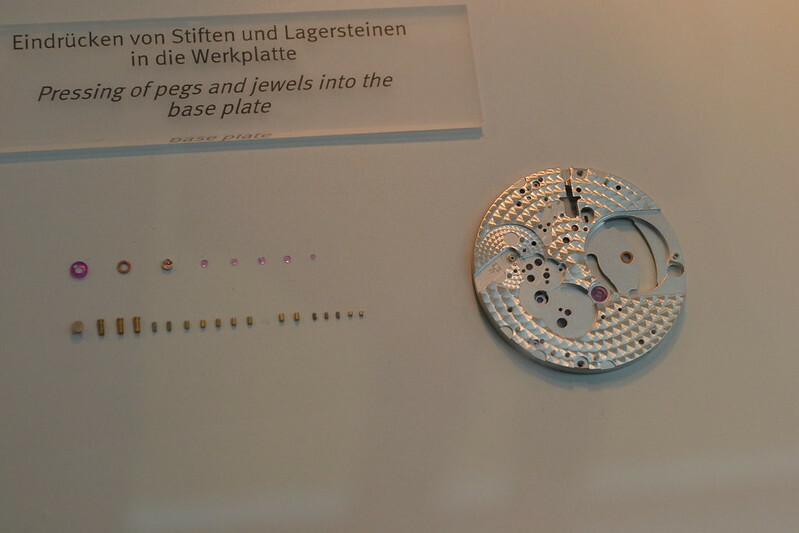 According to our guide, a simple watch might take 20-24 hours of labor to assemble. A moderately complicated watch like my PML might take 40 hours. When I did the math in my head it made me wonder how the economics on these watches work. My PML seems like an even better value now. Conveniently, there was a PML movement completely disassembled for viewing. 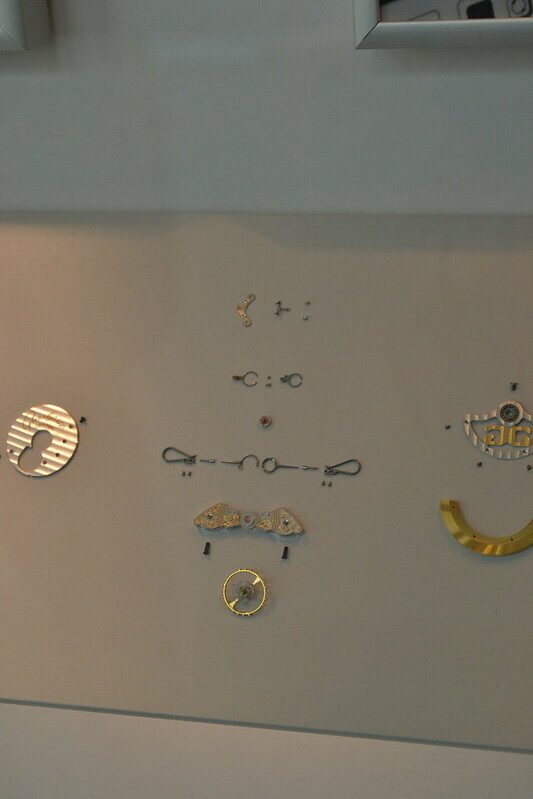 All 296 parts were on display. 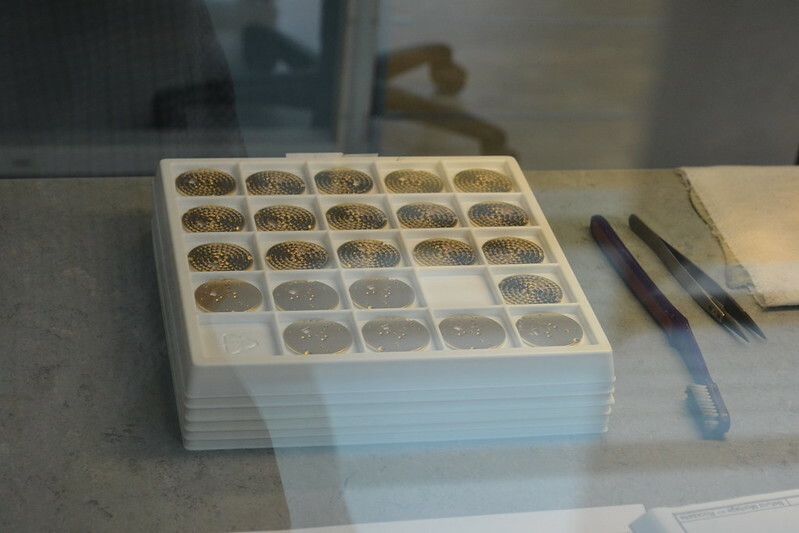 The last stop on our tour was the Atelier, where the most complicated and exclusive special editions are made. 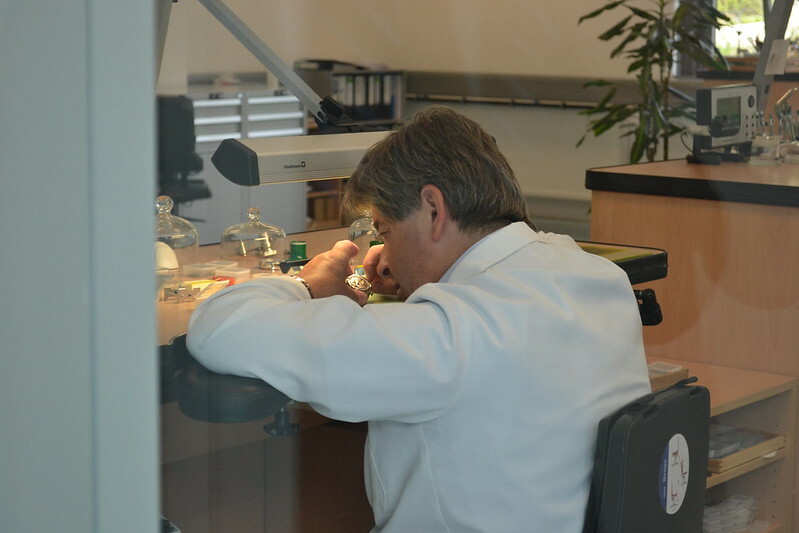 Interestingly, in this area each watchmaker is responsible for assembling one watch from start to finish, rather than working in a small team. I asked our guide if this was considered a prestigious area to work in and his answer surprised me: not really. 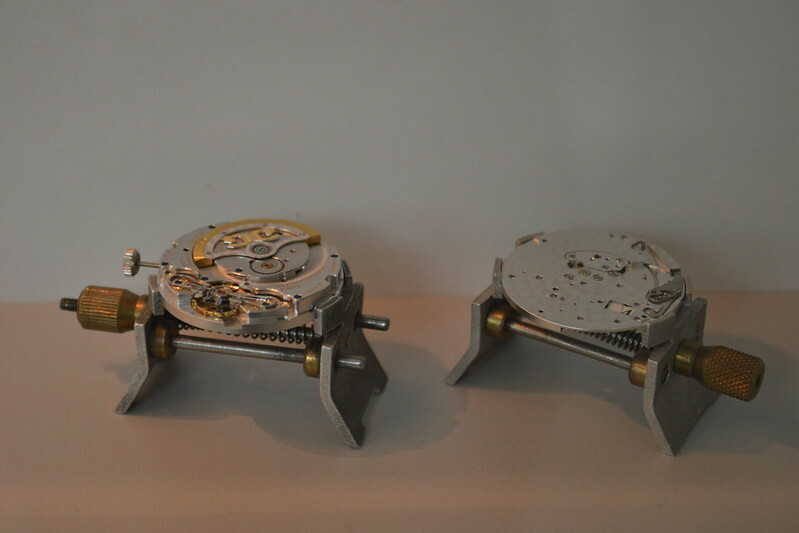 Apparently this is high-pressure work and many of the graduating students don't want or need the added stress of being responsible for every aspect of a complicated timepiece. 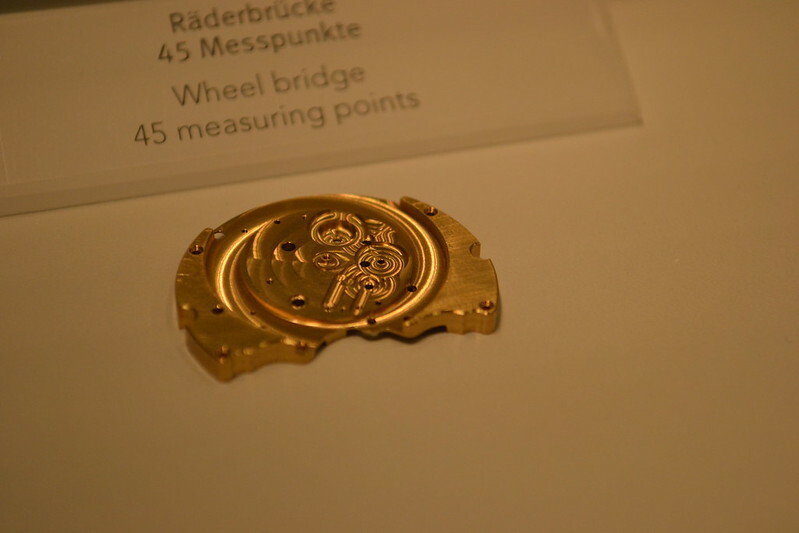 Also, you can't see it in this picture but another watchmaker in the atelier was wearing a prototype of their 30-day alarm watch as a "real life test." So this was my trip. 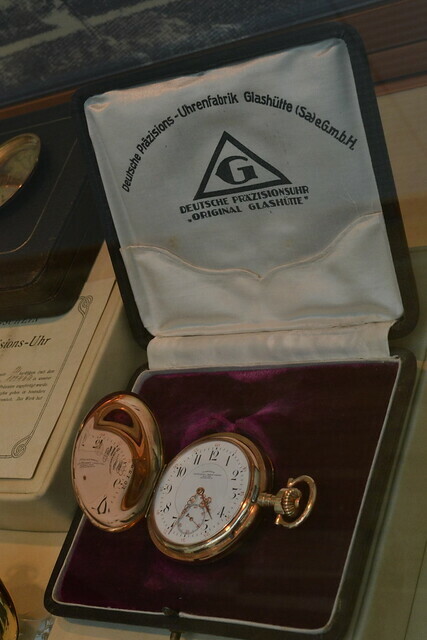 I'd like to thank Glashutte Original for making it a reality and to our tour guide for an amazing overview. I would recommend this to any TZers who happen to be in Germany.